If fraught existence were a town, All Points Bulletin would run it. After a $100 million five-year development from the team behind Crackdown, APB was released, panned, shut down, resurrected and panned again. Yet still the concept of an MMO GTA retains its allure, and we can’t help but sit up when new developers GamersFirst promise big changes. Those changes begin with Reloaded 1.10, the upcoming New Breed Part 3 update. Contacts are APB’s answer to quest-givers, and are the means by which cosmetic items, vehicles and weapons (and their associated modifications) are unlocked. They come ranked in tiers, and the two new’uns to come in 1.10 are tier 5, the highest. Their names are Birth and Templeton, and their quests will unlock most of the updates new additions. Elsewhere there’s the Obeya Systems carbine, an iron-sighted burst fire alternative to the existing Joker carbine that should prove to be more accurate while moving. Field Supplier – Wide Radius: This field supplier can supply teammates from a longer range at the cost of a slightly shorter deployed time. In addition all ammo suppliers will now automatically resupply any valid targets in range that are not actively firing. Spotter: An activatable character modification, this works similar to tagger but without requiring you to hit an enemy. Simply activate and paint enemy targets to show them to all teammates, even through walls. Car Surfer: A utility character mod, this allows you to ride on the roofs of moving vehicles. Great for hitching a ride when there’s not enough seats, or when using a heavy weapon, it does however leave you heavily exposed and without the safety of the car interior to hide when you are hit. Flak Jacket: A Health modification, this heavily reduces damage taken from explosions. This comes at the cost of your ability to dish out explosive damage however, reducing the number of grenades you have available by 1. Fragile: A health modification, this slightly reduces health (14%, just enough that you won’t be 1-shotted by an HVR), but increases your sprint and run speed by the same amount. Perfect for fast assaults and task item carrying. High-Magnification Scope: An upper-rail modification for weapons, this is functionally similar to a Hunting Sight. It also sets your weapons zoom to a very high value (4.66x normal magnification) and replaces your reticule with a Sniper crosshair at the cost of removing your non-marksmanship crosshair completely. 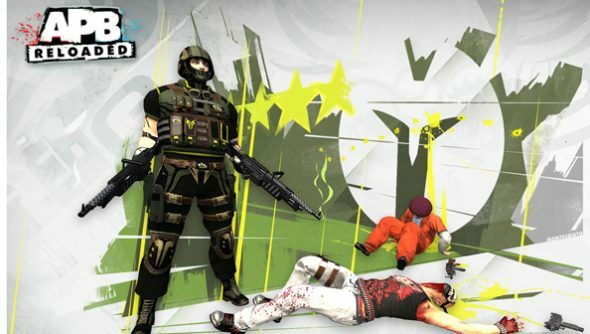 Are you still playing APB? Take to the comments and let us know what sort of state it’s in.